If you are a Position Trader, you will be trading the Uptrend and Sideways trend. If you are a Swing or Day Trader you must trade the Uptrend and Downtrend, and adapt for the Sideways Trend. Swing and Day Traders must be able to take advantage of both the upside and downside price action to net profits, that are close to what a Position Trader can achieve. However the Position Trader will generally always have far higher returns. The sell side or Downtrend is very different from the Uptrend or Sideways Trend because there are fewer Market Participant Groups. Giant Pension and Mutual Funds do not sell short. They may buy Option Puts or Ultra-Bear ETFs, as a hedging or mitigating strategy when the market goes down as they are longer term investors. The Downtrend often has much steeper Angles of Descent™ immediately causing a severe drop in price and often gaps, as HFTs trigger on news events. The Downside also has larger rebounds as it bounces off of Support. How fast the price will fall is dependent on many factors, but the most important factor is always the number of HFTs that trigger the sell-off. The Downtrend can drop with low Volume, and can at times gap down through Technical Support levels. This is due to how and where the Retail crowd and the Smaller Funds set their Stop Loss. A common mistake that many Independent Investors and Retail Traders make is to use a percentage Stop Loss. Since everyone in these groups all use the same percentage Stop Losses, there are many strategies used by HFTs and other professionals that cause these percentage stops to trigger. When this happens the stock usually hits the Stop Loss then rebounds back up. It is the “Cluster Order Syndrome” which triggers HFTs and other algorithms, searching for orders that are clustered around a percentage. As a stock drops, Stop Losses are triggered and the stock plummets. When Independent Investors, Retail Traders, Small Funds, and other groups all use the same percentage such as an 8% or the more popular 10%, it creates a huge Cluster Order at that price range. Algorithms can search for these Cluster Orders that then cause huge sell downs, because of the combination of Selling Short AND Stop Losses firing off at the same time. A stock often plummets within seconds when Stop Losses trigger all at once. You’ve heard the advice before. Treat your trading like the business it is. Yet, every business manager has a P&L spreadsheet model to go by, while individual traders simply hope for the best most of the time. At SteadyTrader, we’ve built a comprehensive Trading Strategy P&L -- a spreadsheet model that can be used by individual traders. You can put all the parameters for ANY long trading strategy into the model within just a few seconds — and it instantly calculates your Annual P&L. Plus, it rolls out the strategy’s Daily Cash Flow. As you may have learned the hard way, “daily cash flow’ can be the hidden time bomb that sinks more trading accounts than anything else. We all tend to assume we know what metrics make one trading strategy better than another. But once you see a real trading system P&L at work, you'll change your mind quickly. Plugging various values for things like "avg. hold", "% winning trades", "avg.gain per trade" often yields results -- at the P&L level and Cash Flow level -- that are quite surprising, if not shocking to many trades. Two stories hit the tape Friday morning that impacted gaming stocks, in particular Wynn Resorts (WYNN) and Las Vegas Sands (LVS).Chinese government pledged support to Macau's economy which had been faltering due to previously imposed austerity measures. Li Gang, the head of the Chinese government's liaison office in Macau, said the central government is considering plans to "support Macau's economy in all aspects," according to the South China Morning Post. The government plans to help boost growth in Macau, including the potential approval of the region's maritime expansion plans by the end of the year. The Chinese government is also looking to help the region boost its tourism. Technically, a Leibovit Positive Volume Reversal was formed and was identified INTRADAY and we purchased both WYNN and LVS. Volume was clearly running a pace early in the session that strongly suggested a Leibovit Positive Volume Reversal would be formed. 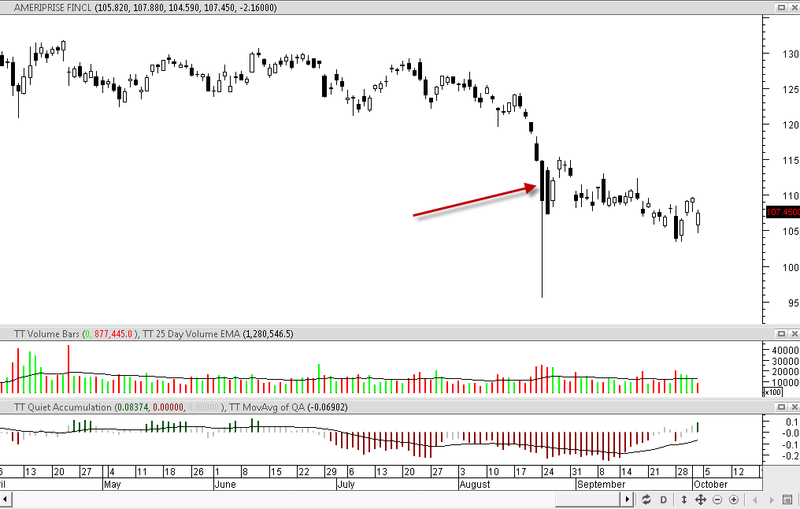 We had been monitoring WYNN and LVS for weeks for any sign a trading bottom might be formed. For example, WYNN had declined from $249 to $50 from March, 2014 to date and was ripe for a huge technical bounce. Looking at resistance in the 50 day, 50 week and 50 month moving averages, upside potential is to 80, 124 and 139, respectively. As a trader, I would be thrilled to get a pop to 70-75 which would represent at 20 to 25 point rally. The bad news. Should the rally fail and using Volume Reversal theory, I would not want to see the October 1 low of 50.96 breached. That would have to be your stop.